Legal Marketing Association Releases "Body of Knowledge"
"Is law a profession, a business, or both? For decades, every law school, bar association, and law society has posed this proverbial question. The fact is that today, the profession of law annually generates more than $700 billion dollars in revenue. There are several million people employed in the legal profession, and hundreds of thousands support it through products and services. Some would even argue that the profession of law has morphed into the business of law. Twenty-eight distinguished leaders in legal business discuss the history, development and the future of the services and products they, their firms, companies and associations provide the profession of law. 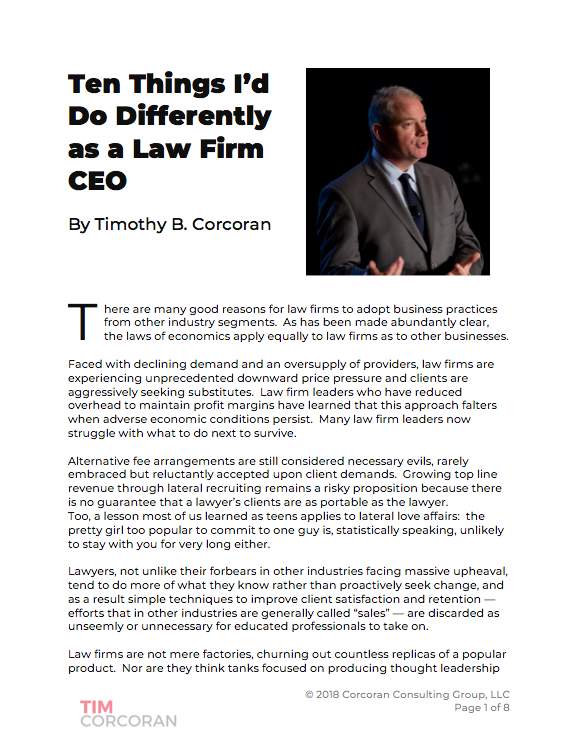 This is must reading for the legal profession." I am pleased to be in the company of some of the fantastic minds helping to guide the profession today, many of whom are good friends as well as colleagues and thought leaders I turn to for inspiration. Take a look at this roster. It's like a live concert with the remaining Beatles joining the Rolling Stones on stage to play the entire Taylor Swift catalog, or something like that! Law Firm Directories and Rankings Derek Benton – Principal, Warwick Vine Consulting Ltd. Knowledge Management Ronald Friedmann – Senior Consultant, Fireman & Co.
And perhaps the best part is the book is free! Click here to download the PDF, and here to download the eBook. Enjoy!